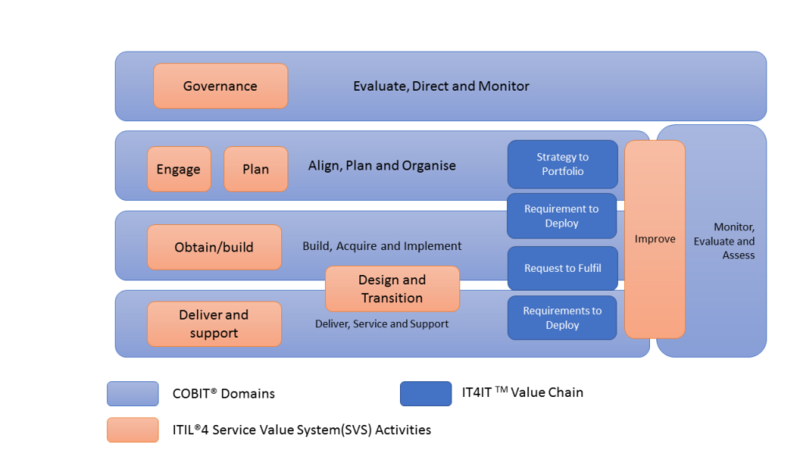 IT4IT, an evolving Open Group standard developed in 2015. IT4IT provides a vendor neutral, technology agnostic and industry agnostic reference architecture for managing the Business of IT. IT4IT standard is focused on defining, sourcing, consuming, and managing IT services by looking holistically at the entire IT Value Chain. While other frameworks and standards have placed their main emphasis on process, IT4IT standard is a prescriptive, process-agnostic, focused on the data/information and relationships needed to manage a service through its lifecycle. IT4IT is intended to applied to streamline the IT functions value flow by applying Enterprise Architecture and Lean principles. TBD: ServiceNow mentions that the “Now” platform is compatible with IT4IT. Are there other tool providers? Will it be a feature that will be part of vendor evaluation?